Eleven2 Review 2019: Is Eleven2 a Good Hosting? With high-performance data centers located throughout the U.S., Europe, and Asia,Eleven2 provides hosting solutions for customers all over the world. They offer plans for anyone from first-time website owners to resellers and customers with VPS and enterprise-level needs. Based on Los Angeles, Eleven2 has been providing web hosting solutions since 2003, and they make a point of keeping their products relevant and up-to-date. Although their main market is North America, they have data centers in the U.S.A, Europe, and Asia. 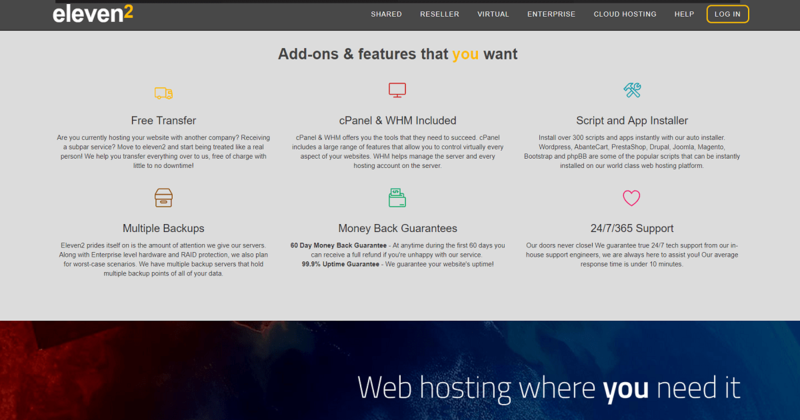 If you see a web host offer cPanel or WHM to manage your web hosting solution,that’s always a good thing They are simply the best control panels available for this purpose and are easy to use, yet powerful. Eleven2’s free domain transfer service also means minimal involvement for you when switching from another host. Eleven2 provides different pricing plans, separated by the type of hosting and who they are most suitable for. There is only one main pricing plan per category, but the sub-plans, with their different specifications and optional paid upgrades, make things more flexible. Shared: A typical shared hosting solution. You can then choose a package based on the amount of storage and number of domains, as well as SSD hosting. Reseller: For customers who manage sites for their clients. All plans come with unlimited sub-accounts with different levels of storage and resources. Virtual: Fully-managed VPS solutions with the added choice to upgrade your memory. Enterprise: These plans come with premium hardware and use Raid 1 redundancy techniques for availability and the safety of your data. They will transfer up to 20 of your cPanel domains for free, with only a nominal fee charged per extra domain. You can also easily upgrade plans at any time by contacting their support staff. There aren’t any free plans or trial periods, but all plans come with a 60-day money back guarantee. They also provide a number of cloud hosting plans that are structured similarly. Eleven2 does seem to take their support seriously. If you’re a customer, you will have the option for 24/7 live chat and they promise a 20-minute response time. There is also a phone line which is available at all hours, besides midnight to 3 am CST. They are particularly good at handling account problems (you will encounter very few technical problems using their platform). Staff can help you switch plans within a matter of a few hours to a day. Whether you are a reseller, an individual website owner or a large company with enterprise needs, you can find a suitable solution at Eleven2. Not only that, but they provideone of the more polished and user-friendly experiences. Wondering how Eleven2 stacks up against other Web Hosting companies? Enter any other Web Hosting company and we will give you a side-by-side comparison.